"The Ghosts of Mars" - Part Two: "Confiding in Strangers"
J'onn and the "spirit" of his dead brother continue to discuss his early years in the League. 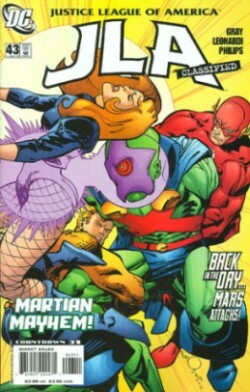 They cover the League's initial battle with Starro the Conqueror, his first meeting with Green Arrow and an encounter with Oliver Queen where he and a disguised Martian Manhunter talk about Ollie's most recent infidelity. They also discuss his brother's fall from grace and how it was J'onn's brother who released Hronmeer's Curse and destroyed his own people. Their conversation turns heated and J'onn's brother hammers the point home that he can't trust the heroes he has made his family. Finally his brother leaves but before disappearing asks J'onn who was it that erased the memories of those J'onn cherished the most; his family. Story - 3: You may notice that the synopsis is a bit...light this time out. Well, what I described is pretty much what happened. I could have gone on and on in excruciating detail about the battle with Starro and all that but frankly it just didn't feel right. So to those of you who like detailed synopsis, I apologize. Before I get into the meat of this review I do want to get something off of my chest, as it were. All of those things I said in my last review about what Justin Gray would possibly do to J'onn? Yeah. I was wrong. None of that came to pass (as of yet) and I feel it would be disingenuous of me as a reviewer to just go on as if I had never written the things I wrote. So I apologize for the rabid, fan boy speculation. I still didn't like this issue. And it took me a while to figure out why too because it wasn't bad. I mean it was fairly well written with some truly character driven scenes and a sense of history, two things I look for in a comic book story. Gray didn't do anything to J'onn that detracted from him as a character outside of making him a tad on the whiny side. The whole thing with the supposed spirit of J'onn's brother and the fact that J'onn can't commune with his wife and kids was even interesting. I just didn't like the issue and I didn't like it because it wasn't written by Grant Morrison or John Ostrander or Keith Giffen with J.M. DeMatteis. Does this make me a snob? Well, yes and no. See, while all of what I just mentioned was interesting it all either felt forced or wrong for the character and my perception of the character as I liked him best was shaped by the writers listed above. Giffen (as plotter) and DeMatteis (as the dialogue guy) gave me a J'onn who had a sense of humor, but only under the right circumstances and mostly a being of incredible dignity and respect who was fond for those he worked with. John Ostrander made him interesting and added a lot to his back story. Grant Morrison reminded us what a valuable member of the Justice League he is. We got glimpses of all that here, but in a style that just wasn't to my liking. I mean it's possible to appreciate what someone is trying to do without liking it. Art - 4: As much as I am not feeling the writing the art is rather good for this arc. I've been looking at Rick Leonardi's work for years and either my memory is faulty, his style has changed or Sean Phillips is doing something to his pencils that makes the art look a whole lot better to me. No matter the case the art is the one thing I have consistently liked over the past two issues. Wow. Two issues. I'm really giving this story a chance, aren't I? Cover Art - 5: PILE ON! Well, the cover is certainly eye catching. It also looks pretty good. Nothing like a super-hero fight to get me interested in what happens this issues. The cover gets a five and it deserves it.